In the run-up to the 2015 General Election, the Independent have been asking 100 people what they would do if they were Prime Minister. These people include journalists, authors, sportsmen, musicians, political campaigners, and the like. Obviously, I'm slightly surprised – and more than a little hurt – not to have been asked to contribute to this… So, with exactly one week to go until Polling Day, I'm going to write my piece about it anyway, and publish it here. If I were Prime Minister, I would introduce on-the-spot fines for anybody who lets a set of double doors close in the wrong order. Y'know how lots of double doors have one door with an outer 'lip', and one with an inner 'lip', and they fit nicely together if closed correctly? I can't understand how anyone can let double doors close behind them in the wrong order and walk nonchalantly away with nary a backward glance, so I propose stamping out this cavalier behaviour with fines of up to £150. That'll be 150 quid, mate. On issues of public health, I would make it a criminal offence not to use the tongs provided at a buffet. I would also make it a criminal offence to serve buffet food without providing tongs. Either of these could elicit a jail sentence of up to six months. Further to this, it would be mandatory for all public buildings to include at least one basin with a foot-operated tap. On education, I would ensure that university students pay twice as much for their drinks in bars and pubs as anybody else. University is a place for learning, not just a three-year-long excuse to get drunk, and students get plenty of concessions in other areas – such as clothes retailers offering student discounts, no council tax payments, and free cheeseburgers at McDonald's. I'm sure the rest of us would relish the opportunity to have a drink in a pub without a bunch of rowdy students shouting, doing 'shots' and having 'fun'. Expanding on an idea I first proposed on this Blog several months ago, any business putting out their special Christmas-themed TV adverts or billboard advertising before the last week in November would see their corporation tax payments double as a result. There is simply no need for companies to start ramming Christmas down our throats in mid-October! While on the topic of advertising, I would ban all television adverts which anthropomorphise food. No one would be allowed to turn right on the Ring Road; it causes far too many delays. If you want to go right, you'll have to go left, left, and left again. I would introduce standardised flavour colours for crisp packets. It is far too confusing for some companies to make Salt'n'Vinegar packets green and Cheese'n'Onion packets blue, while other companies have Cheese'n'Onion crisps in green packets and Salt'n'Vinegar in blue ones. These guidelines will be set down by a new Minister For Crisps And Snacks, who will also be in charge of ensuring even distribution of flavours in 'Multipack' crisps (except Prawn Cocktail, because nobody likes it). Finally, I would hold a referendum on holding a referendum on Europe. Opinion is divided on whether we should have a referendum on Britain's membership of the European Union or not, and so I believe the best and most democratic way to gauge the public mood on this matter is have a referendum on whether or not we should have the referendum – however, this would not be in any way binding upon my government. Obviously, these proposals are just a taste of the decent, common sense policies for hardworking men and women which my government would introduce. A full copy of the UKIT Manifesto (no, that doesn't stand for anything – it's just a bit like UKIP but with my name in it instead, and much better policies) is available on request. This sandwich has suffered from a classic case of overmayonation; the quality of the beef (as good as you would expect from M&S) is sadly masked by an overpowering layer of creamy mayonnaise, making it difficult to enjoy the other ingredients. It doesn't help that this is supposed to be 'horseradish mayonnaise', but there is only the merest hint of horseradish – it is so mild, it may as well not really be there at all. Unfortunately, this results in a sandwich which is bland and unsatisfying. Personally, I would prefer just horseradish sauce, not a specially flavoured mayonnaise, and I would like it to have a bit more bit to it. Obviously, fans of both Aston Villa and West Ham will care. But does it really matter which team David Cameron supports – if any? No, of course it doesn't. But the news of the Prime Minister, who says he supports Aston Villa, mistakenly claiming to be a West Ham fan in a moment he describes as 'brain fade' has gripped the nation. Labour supporters have seized upon this with glee – Cameron doesn't even know which football team he supports! Apparently, this makes the Tory leader 'a fraud' or a 'con man'. The trouble is, when it comes to things like football, politicians in the UK are in a no-win situation. We (the electorate) supposedly insist that our politicians be 'normal' and 'everyday' enough to be football fans. Can you imagine the reaction if a Conservative party leader simply came out and said he wasn't a big football fan, and it just wasn't really his thing? Opponents would jump on this confession as evidence that he doesn't understand ordinary people; that he's out-of-touch; that he's 'posh'; that he can't be possibly be fit to be Prime Minister. So, politicians who aren't that bothered by football have to pretend to be into it. And that is then held up as evidence that they are posh, out-of-touch, and don't understand ordinary people. And it also backfires on politicians who genuinely do like football (or Game Of Thrones, or Nandos, or any other aspect of modern popular culture) because people assume that they're being insincere charlatans who are only saying they like those things to appear 'normal' and win more votes. Either David Cameron is not a football fan, but feels compelled to say his is because the fetishisation of 'normal' in politics won't let him be himself – or is actually is a football fan, but people still sneer at him for it because they assume he's putting it on to seem like a 'man of the people'. He can't win. Ultimately, it doesn't really matter which football team the Prime Minister does – or does not – support. This whole episode simply serves to distract from what the real focus of an election campaign should be: policies. But it also demonstrates how our obsession with politicians being 'normal' is so much of what is wrong with politics in the UK. Harder and harder as you go on. Who watches the Apple Watch men? No, I shan't be buying an Apple Watch – the latest offering from Apple, which is available in the UK today. I may have a MacBook Pro, an iPhone, an iPad and an iPod Classic, but I really can't see myself investing in Apple's latest output. 'Wearable tech' is not a good look. No matter how classy Apple try to make the Apple Watch, ultimately it is still a gadget, and a watch should not be a gadget – it should be a classic, timeless (ironically!) piece of jewellery. My own watch was a twenty-first birthday present from my Grandmother. 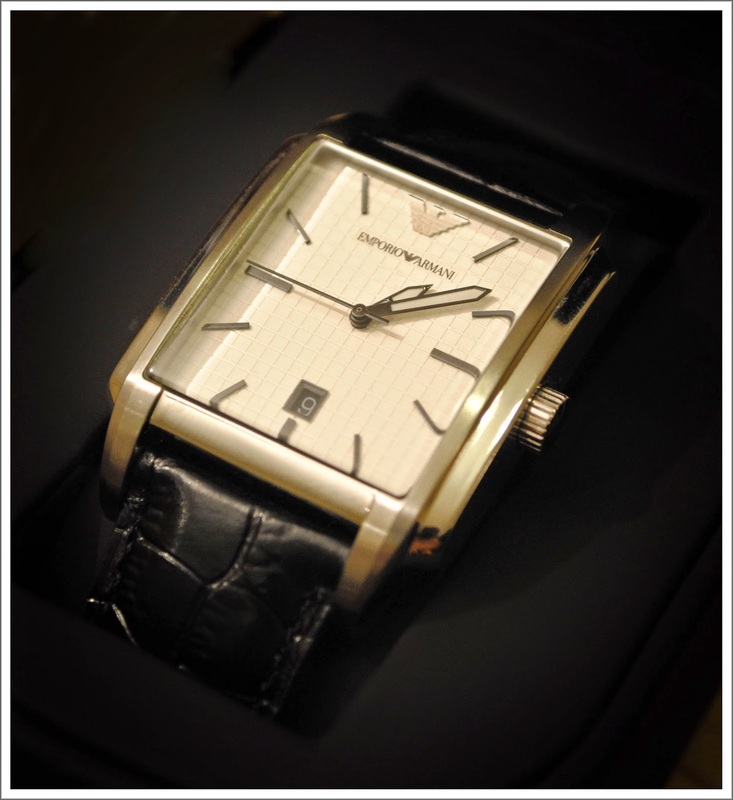 It is a square-faced analogue Armani watch with a black leather strap, and I wear it every day. I don't need apps and other techery on my watch – I already have that stuff on my laptop, and on my phone – and I'd rather wear a timepiece which is simple, elegant and beautiful, and which won't be obsolete within five years. photographing watches when I took this in 2011. Roasted vegetables with sunblushed red pepper mayonnaise, Greek Feta cheese, Kalamata olives, and spinach on red pepper bread. This is URBANeat's 'Monthly Special' offering, and is something a little off-the-beaten-track when it comes to sandwiches. Overall, however, I enjoyed this sandwich – it is an interesting recipe, and it's been generally well-executed. There are a variety of flavours at work, here, but they all compliment each other nicely, and the filling works well as a whole package. The only disappointing elements were the promised Kalamata olives – I didn't spot any – and the red pepper bread, which had very little flavour to it and was almost indistinguishable from ordinary bread – as is so often the case with 'speciality' breads in these kinds of situations. Nevertheless, I did enjoy this sandwich, and I am very pleased to see established brands like URBANeat branching out, pushing the boundaries and trying new things. I would buy this sandwich again. Is Ed's #Milifandom a force for good? Started up by Twitter user '@twcuddleston', and gaining momentum and breakneck speed, the 'MiliFandom' is one of those strange, left-field phenomena which no one could ever have predicted would be filling news columns just a few weeks out from a general election. Ed Miliband having his own ‘fandom’ of adoring teenage girls would’ve seemed extraordinarily unlikely even just a couple of weeks ago – but a quick search on Twitter and an article on BuzzFeed confirm that this is in fact the case. Personally, I have always found the ‘fandom’ concept a little odd – it is a strangely cultish attachment to an icon whose cultural significance is transient and often quite flimsy (most likely a pop star, or television programme). Ultimately, however – although these things do sometimes have a dark side – they tend to be relatively harmless; the kind of teenage obsessions many people have felt, fuelled by the passions and the certainty of youth, which subside as we progress into ever more bewildered adulthood. When it comes to politicians, though, I’m not sure this is actually the case. Most ‘fandoms’ start out as a genuine liking for that particular thing – but this quickly morphs into besotted fanaticism where the object of the fandom’s adoration can do no wrong. This is why the most obsessive fans of pop singer Justin Bieber still leap to his defence even when he is caught drink-driving, or when he is seen on video spitting at his own fans. From a rational, objective standpoint, this is disgraceful, indefensible behaviour and Bieber should be hauled over the coals for it; his ‘fandom’, however, make excuses for him and defend him, because their idol could never be to blame. And in doing so, members of the ‘fandom’ signal to each other what die-hard fans they truly are; somebody who enjoys Bieber’s music, but believes drink-driving is just not on, is not enough of a ‘true fan’ – the more obsessive you become about your hero, the more of a real fan you are, and the more you prove your unwavering faith to the rest of your peers in the ‘fandom’. I don’t believe we should see politicians this way. We should respect them for taking on a difficult, often thankless, but incredibly important job – and we should give them credit when they do it well (something we currently do nowhere near enough) – but we should also view them with a healthy scepticism, not with wide-eyed adulation, or with the dogmatic devotion of religious zealots. In despotic dictatorships, political leaders demand to be worshipped; they demand unthinking praise, and total fealty even in the face of rational criticism. The cult of personality around 'the leader' in North Korea is particularly intense. In such climates, questioning a politician – or any authority – is unthinkable. Ed Miliband has not demanded this deification – in fact, he seems slightly embarrassed by it – but it is disturbing all the same. The blinkered hero-worship of ‘fandoms’ is the antithesis of rational debate and the exchange of ideas; no matter how much it might help young people to 'engage' with 'issues', when politics becomes about the former, not the latter, we are all in trouble. The BBC's Challengers' Debate which aired last Thursday was interesting for several reasons. It was particularly strange to see Ed Miliband – remember him? 'Hopeless' or 'useless' Ed Miliband – come off surprisingly well, seeming the sanest, most serious option with the most credibility compared with the leaders of four minor, rather parochial parties. One of the most frustrating things, however, was the evidence that the concept of a 'Progressive Alliance' – of all the parties who are even vaguely on 'the left' of British politics teaming up to work together 'for the common good' – still hasn't died the death it richly deserves. In the UK, we live in a multi-party democratic system; something which most 'progressives' consider a good thing, and would want to increase. "Multi-party politics is here to stay!" claims the Electoral Reform Society, who say they campaign for 'a better democracy'. Why, then, do the leaders and representatives of self-professed 'progressive' parties forsake this view when push comes to shove, and instead attempt to reduce politics to a simple, binary choice between 'the Tories' and 'not the Tories'? On the BBC debate last week, Scottish National Party leader Nicola Sturgeon made an offer to Ed Miliband, claiming she could help the Labour leader 'lock out the Tories' (a stance which is rather at odds with the SNP's earlier claims that Labour and the Conservatives are 'all the same' – if this were really the case, why would Sturgeon be happy to work with one but not with the other?). The implication of this exchange between Sturgeon and Miliband, however, is that it is actually Labour and the SNP (and the Green Party, Plaid Cymru, and anyone else who comes under the broad 'progressive' banner) who are 'the same' – simply by dint of not being the Tories. There may be some common ground between these parties (both the SNP and Labour are advocating a 'Mansion Tax', for example), but there are fundamental differences, too. Even aside from the most obvious split between the parties – that the Labour Party is innately unionist, whilst the SNP have long campaigned for Scotland's independence – there are other issues on which the parties are divided (for example, on the renewal of the Trident Nuclear Deterrent, which Ed Miliband explicitly said he supported during last week's debate on the BBC). Add into this mix the Green Party – which might agree with the SNP on Trident, but has starkly different plans from Labour in areas such as immigration, education, and a referendum on Britain's membership of the European Union – and Plaid Cymru – who oppose welfare caps and are looking for billions more funding to devolved Wales – and we can see that the concept of the 'progressive alliance' airbrushes the heterogeneity of these different parties and their diverse aims and policies, instead assuming that anybody who doesn't vote for the Conservatives automatically dream the same dream and want the same thing. This doesn't mean that these parties could not work together in a coalition government, or in a 'supply and confidence' voting arrangement – we have been governed for the last five years by a coalition of two parties who disagree in many areas, after all. But this is different from the suggestion that these parties are all the same because they all disagree with the Conservatives. Indeed, on some issues, a 'progressive' party may agree more with a party on 'the right' than with their fellow left-wingers. For example, the Green Party propose to hold a referendum on Britain's rôle in the EU (although they would campaign for Britain to stay in); the Conservatives have also promised an EU referendum, but Labour (much more a natural ally of the Greens, you would think) have ruled it out. The Green Party also support scrapping the costly HS2 high-speed rail infrastructure project – another area where they align with UKIP policy instead of with their 'progressive' counterparts in the SNP, Plaid Cymru or Labour. To lump all these 'progressive' parties in together as being in agreement with each other, and as opposing the Tories, consistently and across the board, is simplistic and wrong. It is worth remembering that, in the UK, you can only vote for a party or candidate – you cannot specifically vote against a party or candidate. It is fallacious to claim that a vote for any one party is automatically a vote against another party, and a de facto rejection of that party's stance on all issues. Any attempt to turn the UK's interesting and diverse plurality of left-wing political parties and movements into one homogeneous bloc with the same views and the same aims, therefore, is extremely facile. The 'progressive alliance' remains, I am afraid, a delusion which exists only in the minds of nerdy politics wonks obsessed with strategies and polls, and naïve left-wing student 'activists'. 'Democracy', we are told, is a good thing. Unfortunately, it turns out most people no longer know what 'democracy' means. According to Graeme Archer (writing today for the Daily Telegraph), a minority Labour government supported by the Scottish Nationalists would 'have no democratic legitimacy'. As Twitter user 'Primly Sable' points out, this must mean the last coalition government also 'lacked legitimacy'. @TeleComment @graemearcher So the current government also lacks legitimacy? And it's true that I did see plenty of people complaining about the coalition in 2010, claiming that the government had no mandate. Phrases like "nobody voted for this government!" were very much in evidence (despite being demonstrably false). The truth is, however, not that those people genuinely believed the coalition government 'lacked legitimacy', but more that they simply didn't like the coalition government. All too often, questioning a government's mandate is simply a tactic to damage the credibility of a government you don't support. I do not like the SNP. Not one bit. But it is ludicrous to think that, if they win a significant number of Westminster seats on 7th May (as well they might! ), any influence they end up having in a UK government is somehow 'illegitimate' – as if they took part in some sort of heist. Like MPs from any other party, SNP MPs are democratically elected to parliament, because that is who the voters in that constituency want to represent them. And although the SNP, or their supporters, have occasionally been guilty of this themselves (think 'postal votes' in the Scottish Independence Referendum last September! ), being an advocate of democracy also means not crying 'foul!' and branding the whole system bankrupt just because you end up with a result you don't like. It's fine not to like the government – in fact, it should be encouraged! But if that's the case, just say so, instead of hiding behind high-minded obfuscation about 'democratic legitimacy'. #F1 – Why does it always Bahrain on me? Hamilton was relatively comfortable throughout the race, and he led most of the laps. Ultimately, I don't think the win was ever in doubt, for him. However, Ferrari showed that their resurgence in Malaysia at the start of the month was not a flash in the pan – they really have got a package which can challenge Mercedes, and two drivers capable of scoring points and podium finishes. That makes them genuinely threatening. In the first three races of this year, it has been Sebastian Vettel who has been doing the business for Ferrari, taking the fight to the Mercedes of Hamilton and Rosberg; Kimi Räikkönen, by contrast, has been a little disappointing – often through no fault of his own. It has been interesting to see Vettel in this role of 'challenger', actually, after he was so frequently criticised during his time at Red Bull as being too reliant on Adrian Newey's masterful engineering, and only being so dominant by dint of having by far the best car on the track. This theory was borne out last year when Red Bull were no longer the dominant team, and Vettel seemed to fall away as his young teammate Daniel Ricciardo was the one to cease victory from Mercedes on a few occasions. This season, however, Vettel has definitely answered his critics – and emphatically. This year's Ferrari is a very good car, but it still plays a meek second fiddle to the might of the Mercedes. Vettel has been able to match Mercedes, and beat them, in the second-best car. The answer is that Vettel is not a race winner only when he has the best car – but he is a race winner when he has a car in which he feel comfortable. Last year's Red Bull was not a car Vettel enjoyed driving, and his performances demonstrated that; at Ferrari, Vettel feels happier, and so he is driving better. Räikkönen, too, feels much better in this year's Ferrari than he did in last year's car – and this time out, he showed that he is also a threat to the pace-setters at Mercedes. Räikkönen was his usual, laconic self – but I expect that he will secretly be quite pleased to be back on the podium, and to seem more on level terms with a multiple World Championship-winning teammate in a way he never managed when he was paired with Fernando Alonso at Ferrari last season. Further down the order, Williams' race was compromised by Felipe Massa's failure to launch for the formation lap, but Valteri Bottas drove an excellent race to keep Vettel behind him and finish fourth. Daniel Ricciardo is still the real deal, hauling the Red Bull into sixth place where its Renault engine doesn't really deserve to be. However, his teammate Daniil Kvyat has had a troubled start to this season, with the Bahrain Grand Prix being no exception, which leads me to question Red Bull's strategy of promoting young drivers from their junior programme so soon – I'm not sure whether Kvyat wouldn't have benefited more from a second season at Toro Rosso, rather than being fast-tracked into the senior team, with all the added pressure that entails, at just twenty years old. For Lotus, a vastly improved car and a switch from Renault engines to Mercedes engines has brought more consistent points finishes – but only from one driver. Romain Grosjean has brought home all the team's points so far, while Pastor Maldonado has failed to finish a single race this year. Now that Lotus have a competitive car again, they need two competitive drivers if they are to amass points and realise their potential – there is only so long that Maldonado's erratic ways can be tolerated by a team fighting in a packed midfield. If engineers are being required by the rules of the sport to design and create cars which look good, it starts to become theatre, not racing. Racing cars should be designed to go as quickly as possible (within the rules), and however they look is how they look. All that matters is the performance. If designers have to consider aesthetics as well, this could impact negatively on the performance and therefore on the quality of the racing, and this would not be a good thing. The 'look' of the race should always be secondary to the actual competition of racing; if sparking and other excitement is genuine, that's great – but if it isn't, we shouldn't try to add it in artificially. Nick Clegg must have become fairly accustomed to being given a hard time in the media over the past five years (not always deservedly), but even so I was surprised to hear that Newsnight's Evan Davis had interviewed Clegg recently and brought up the Liberal Democrat leader's European heritage (his mother is Dutch) and multilingualism as evidence that he might be 'out-of-touch' with the 'British working class'. Of course, 'out-of-touch' is a spectacularly vapid and meaningless accusation to level at any politician – but these comments by a presenter on one of the BBC's flagship political programmes strike me as particularly stupid. What, exactly, does Mr Davis feel is bad about Clegg being able to speak more than one language? The idea that if a politician has at least some level of intelligence and decent communication skills, that should somehow count against them is one I find completely baffling. In matters of trade, of diplomacy, or of foreign policy, multilingual Clegg – who speaks five languages fluently – is surely an asset to the British government when it comes to communicating with foreign diplomats and politicians, and forging relationships with other nations? And think about those photographs you see in the press sometimes – more frequently than ever, now, as we approach a general election – of politicians desperately trying to look at ease as they meet people in a mosque or a gurdwara, but clearly not feeling comfortable… It might be fun to make amusing posts about it on Tumblr, but integration is a real issue which politicians often don't do enough to address. Maybe the sons and daughters of immigrants in government – who have an innate understanding of other cultures – would be able to reach out to other communities (both in Britain and abroad) with more success, and help to improve relationships between them? To dismiss Nick Clegg as 'out-of-touch' or 'élitist' is foolish – to do so because he possesses skills which are actively useful and beneficial in the day-to-day work of government is just staggering. If I were the leader of a political party ("ohh, if only!" I hear you say), the only thing I would 'rule out' at this stage of my campaign is ruling anything out. I can't, for the life of me, understand our premature obsession with 'deals' and 'red lines' in the run-up to this year's General Election. It's like we all got bitten by the coalition government bug five years ago, and now we want to skip the actual business of campaigning and voting altogether so we can get straight down to the good stuff – the coalition negotiations. The trouble is, it's very difficult to negotiate 'blind' like this. Which is why I think it so incredibly foolish for party leaders to be ruling out dealing with certain other parties already – and so irresponsible of journalists and others to try and hustle them into doing so. You (as the leader of a political party) might well say you would never deal with party x in the event of a hung parliament – and you might very well mean it, too – but it's all a little meaningless when you don't know how many seats they're going to have after the vote, or even how many seats you're going to have! If a deal with party x then becomes your best (or only!) option, you're going to regret that you backed yourself into a corner during the campaign in order to win a cheap round of applause during a television appearance. Increasingly, it seems that this is exactly what our political leaders are doing – laying the groundwork for coalition talks before they have any facts to deal with. And that, to me, seems rather daft. What if Norwich don't go up? With three games left in the Championship this season, Norwich sit second in the table, one point off Bournemouth (who are top); promotion is entirely within our grasp, and our fate is in our own hands. Things are looking good. So, ever the gloomy realist, my mind has turned to thoughts of what will happen if, from this position of strength, we fail to win promotion to the Premier League. If we stay in the Top Two, where we currently are, automatic promotion will be ours and everything will be straightforward – but if we slip only a small way into third (which, in a league as tight as this, is eminently possible), we are faced with the unpredictability of the Play-Offs, where anything can happen and where there are no second chances. Even now, it's not impossible that we will still be in the Championship next season. So, what happens then? Well, hopefully: nothing. We've got a good thing going here – even if we don't achieve our stated aim of promotion to the Premier League, we must do everything we can not to mess that up! Alex Neil has done a fantastic job since taking over at Norwich in January, and almost all Norwich fans are now giving him the credit he fully deserves for our recent good form. Despite this, I fully expect to see a slew of 'sack the manager!' posts on social media if, for whatever reason, we don't go up this year. Neil's record at Norwich currently is: Played 19; Won 14; Drawn 3; Lost 2. That's a 73.68% win percentage – and 89.47% of games unbeaten. Those are some pretty remarkable statistics. On top of that, we have an excellent squad who – bar a few blips across the season – have worked brilliantly together, shown true team spirit, and played some excellent football. Overall, we're doing a lot of things right, and should we fail to be promoted this season the call should not be for radical change, but to try and preserve what we already have, and everything that is good about it. Today's Chinese Grand Prix may have been described as 'unremarkable' or even 'dull' by many fans, but it has added some interesting new details to the overall narrative of this 2015 Formula 1 season. Following a somewhat unexpected challenge from a resurgent Ferrari team who ended up taking victory in Malaysia two weekends ago, Mercedes were back on top in Shanghai, and it was more or less 'business as usual' for Lewis Hamilton, with the World Champion Qualifying on Pole, leading every lap of the Grand Prix and taking the win at the end. However, the continually shifting dynamics of Hamilton's relationship with his teammate Nico Rosberg have been fascinating to follow so far this season, and this weekend was no exception. As I wrote after the race in Malaysia, Rosberg has seemed cowed and timid compared to last year, seeming still to be suffering the psychological effects of losing the Championship to his teammate last year – Hamilton, by contrast, has been confident and self-assured. I think the Mercedes team have noticed this too, and there have been plenty of reports that Rosberg was told to 'toughen up' and be 'more aggressive' for the race in China. He certainly changed his approach in response to this – but it was a disaster for him. I think Hamilton and Rosberg are intrinsically different characters. Of course, this is no bad thing – and it doesn't mean that either man's mindset is empirically 'better' or 'worse' than the other's. Last year, stable, unflappable Rosberg often seemed to have a psychological edge over the more emotional Hamilton; his calm, steely demeanour meant he was better able to deal with setbacks, and the pressures of fighting a close title battle with his teammate and friend, than Hamilton, whose volatility often left him vulnerable and exposed. To put it simply, Rosberg raced with his head while Hamilton raced with his heart. Unfortunately for Rosberg, now that Hamilton has beaten him to the title once, he is struggling to come to terms with that. He feels like a Number 2 driver – and so, he acts like one, and he races like one. I mentioned after Malaysia about how 'jittery' Rosberg seemed – especially in the way that he seemed to be always on the radio to his team asking for more information about what was going on in the race. In trying to be 'more aggressive' this time out, he simply came over as surly and sulky. I think Rosberg has (mistakenly) interpreted the team's instructions to be more aggressive as telling him to be more like Hamilton – and, not being cut from the same cloth as his teammate, this approach isn't working for him. Rosberg needs to be his own man, and race his own way. He needs to return to the mindset he had last year – that although they are very different in many ways, he is Hamilton's equal, and is capable of beating him on merit. At the moment, Rosberg doesn't seem to be able to believe he is capable of beating his teammate, and that lack of belief is manifesting itself either in a strange timidity which we have been unused to seeing from the German, or in a morose demeanour which may make people want to stay well clear of him on track, but certainly isn't helping him go any faster. Nico Rosberg is a very good racing driver, with plenty of strengths of his own. It may be difficult for him to keep faith in his own way of doing things, having been (as he will no doubt see it) bested last season by Hamilton's 'heart-on-his-sleeve' approach. But at the moment, he is not comfortable in his own skin, and that translates to being uncomfortable in the car; he is still pulling in the results at the moment, because the Mercedes is still the best overall package in the paddock, but the team won't put up with a sulky, malcontent, underperforming driver forever. Rosberg has the potential to be a World Champion, but he needs to stop comparing himself to Hamilton and rediscover his belief in himself as a driver if he is ever to realise that potential. The longer this saga goes on, the less likely it becomes that he will achieve that goal this season – and the affects of losing out to Hamilton two years running could finish him off. Is it 'now or never' for Nico? Obviously, this is an unnecessarily rude and personal attack on any politician, as anyone but a less-than-halfwit can see. But it also makes very little sense. Eton is the school David Cameron went to; this chap is telling the Prime Minister – who is almost fifty years old – to go back to school. Why? It is a vapid, meaningless slur against the Prime Minister, singling out one of least important things about him – something over which he almost certainly had no control himself (how many children choose for themselves which school to go to, independent of their parents' influence?). Why the Daily Mirror (amongst others) feels the need to give the inane babblings of this busking buffoon the oxygen of publicity is completely beyond me. Aren't there any actual news stories they could be reporting? White bread with oat and barley, Ham Hock, West Country extra mature cheddar cheese, onion and ale chutney, free range egg mayonnaise and mixed leaf. Tesco have really pulled off something special here. The balance of flavours and the quality of the ingredients is very impressive. The strength of the cheese in sandwiches has been a particular bugbear of mine recently, as I always feel companies err on the side of caution and make their cheeses too mild – thankfully, Tesco are using extra mature cheddar here, and the flavour does actually come through in the sandwich. The mix of the cheddar and the 'tangy onion and ale chutney' is perfect. Overall, this is fantastic sandwich – the concept is a simple, elegant recipe, but it has been extremely well executed, and I can't commend Tesco enough on this effort. It shouldn't matter what politicians wear, should it? Sadly, in the modern age, such image-related issues have become the main focus of election coverage; the politics of personality – of identity – has superseded the politics of ideas in a quite alarming fashion. Which is why the BBC News website today is running a story about what shirts David Cameron, Ed Miliband and Nick Clegg have been wearing on the campaign trail. It shouldn't matter. And yet, for some reason, it does. It matters because the strangely homogenous garb of political leaders (all three leaders have favoured a dark blue V-neck jumper over a light blue shirt, with dark jeans or trousers) is indicative of the 'no-win' situation many politicians find themselves in. What I mean by that is that politicians are always being told that we (the electorate) want to see politicians who are 'normal', and who act just like 'ordinary people' (whatever that means); they can't go out and about campaigning in a suit and tie, because 'normal people' don't go out in a suit and tie, and they need to look like they're 'one of us'. And yet when they try to look like 'one of us', we lambast them for trying to look 'normal'. Which is pretty mean of us, really. It's also pretty stupid. This shallow vapidity distracts from the serious side of politics, and while everyone's busy laughing at the Prime Minister trying to be one of 'the kids', or the leader of the Opposition looking silly while eating a bacon sandwich, their policies – which may well be pretty ghastly – go unnoticed. 'How the leaders would dress if they weren't tied to focus groups' would be an interesting feature. I reckon Ed would untuck his shirt. The fetishisation of 'normal' is not good for British politics. The more we force politicians to behave in the way they think we want them to, ever fearful of putting a toe wrong lest they be laughed out of office by the court of public opinion, the more homogenous and consensual politics becomes, and the less choice there is (or, at least, appears to be) between the different parties and their different leaders. And then we have the temerity to complain that all politicians are 'the same'! Maybe you think politicians are all the same – but as I have remarked before, the incessant whining of the electorate has made politics that way. Obviously, there are plenty of valid reasons not to vote Liberal Democrat – for example, if you don't agree with any of their policies, or you prefer another party and think they'd do a better job in government – but there are also a good many people around in the run-up to the 2015 General Election claiming they won't vote Lib Dem for reasons which are, to put it politely, utterly daft. Of course, people are free to vote for whoever they want, and for whatever reasons they want – but I think it's probably worth explaining why a couple of the reasons people have for not voting Lib Dem are daft. Nick Clegg and the Liberal Democrats betrayed their voters by going into coalition. Let's ask a very simple question first: why do people vote for a particular political party? There can be plenty of reasons, but I would imagine that one of the main reasons for voting for a party is that you like their policies. People who voted Lib Dem in 2010, therefore, presumably wanted Nick Clegg and his party to be in government. And that is what they got. By going into coalition, the party were not able to enact all of their manifesto pledges (more on that later), but at least some distinctive Liberal Democrat policies (a referendum on a more proportional voting system, raising the personal tax allowance threshold, equality of marriage, etc.) have become law during this parliament. If you are a supporter of the party, and believe their policies to be good for the country, even just one of their policies coming to fruition is better than none; the real 'betrayal' would've been if Clegg had had an opportunity to give his party's voters what they said (via the ballot box) they wanted, and had turned his back on it. Image by Mark Pack (www.markpack.org.uk). There is an argument that saddling Liberal Democrat voters with Tory policies which they didn't want was not worth the opportunity to deliver a few of the Liberal Democrat policies they did want, but this is based on a spurious assumption – ie. that a vote for the Lib Dems automatically counts as a vote against the Conservatives. In a two-party system, this is a more-or-less true; in the American Presidential elections, for example, where there is a straight choice between Candidate A and Candidate B it could be said that a vote for A is a vote which says 'no, I don't want B'. In the UK, where multi-party politics is on the up, this is not the case. Our voting system only allows you to cast a vote for a candidate or party – not against a candidate or party. It is therefore disingenuous to say voting Liberal Democrat is an empirical rejection of Conservative policy. The hung parliament which was the result of the 2010 general election was a democratic result – no major party managed to convince enough of the electorate that their ideas were best for the country. The coalition government which followed was, necessarily, a compromise – but one which ensured that 59% of the electorate (36% Conservative, 23% Lib Dem) got at least some of what they had voted for. Nick Clegg and the Liberal Democrats broke their promise(s). Tuition fees. The thorn in the side of the Lib Dems for the past five years. During the 2010 election campaign, Nick Clegg promised that he would not raise tuition fees for university students (which at that time were capped at £3,000 per year). In government, the Tory-Lib Dem coalition raised the maximum figure to £9,000 per year. As a result, the Liberal Democrats have suffered hugely, having been seen to break their promises on the subject. However, this is false logic. The promise – the pledge – was null and void the moment the coalition agreement was signed. When a politician promises to do something in the run-up to an election, that promise comes with a caveat – ie. that that politician is actually elected. The small print of every manifesto pledge is '…if we win a majority'. Nick Clegg didn't promise not to raise tuition fees; he promised not to raise tuition fees if the Liberal Democrats won a majority. And they didn't win a majority. You may as well get all stroppy with the Labour party for not introducing 'legally binding guarantees for patients including the right to cancer test results within one week of referral, and a maximum eighteen weeks' wait for treatment or the offer of going private', as promised in their 2010 manifesto, as well. But Labour didn't win the 2010 election, so how could we expect them to uphold all the promises they made before it? So even if the tuition fees increase were a bad thing (and there is plenty of evidence to show it may not be, considering that it also entailed a significant change in the way repayments are worked out after students graduate), it simply does not follow that the Lib Dems broke their promise here. A coalition government requires compromise – that much should be fairly obvious. Raising the tuition fee limit was not Liberal Democrat policy before the 2010 election, but it was Conservative party policy; in order to enact Liberal Democrat policy in other areas, Clegg must've ceded ground to the Tories on the issue of tuition fees (possibly after being shown the arithmetic in the Blog posts I have linked to above, and realising that the rise in fees would not be so bad after all). You can't expect a junior coalition partner to have things all their own way – there were always going to be areas in which Lib Dem policy would lose out to the Conservatives. As I've said, there are perfectly valid reasons to vote for a party other than the Liberal Democrats. And that's fine. But personally, I think a General Election is too big and too important to vote for a party – or not to vote for a party – based on spite or grudges.